Online communities generate major economic value and form pivotal parts of corporate expertise management, marketing, product support, CRM, product innovation and advertising. Communities can exceed millions of users and infrastructures must support hundreds of millions discussion threads that link together billions of posts. Current solutions fail to meet current challenges of scale and growth, let alone support for understanding and managing the business, social and economic objectives of the users, providers and hosts involved. Extensive research into novel solutions is required to deal with both the large-scale data management and analysis tasks as well as to understand and manage complex user behaviours and ecosystems in online business communities. ROBUST created models and methods for describing, understanding and managing the users, groups, behaviours and needs of online communities. A highly scalable cloud and stream-based data management infrastructure architecture was developed to handle the real time analysis of large volumes of community data. Simulation and visualisation services were developed to support detailed understanding, prediction and exploration of possible actions. IT Innovation was responsible for developing risk models and a framework for pro-actively managing risks in online communities. We developed a prototype web application, Community Analysis Tool (CAT), demonstrating how community owners can manage their communities with respect to risk. We identified and addressed common risks such as community becoming inactive, users leaving the community and poor content quality. However, there's a flip-side to risk, where there are opportunities, such as gaining experts. 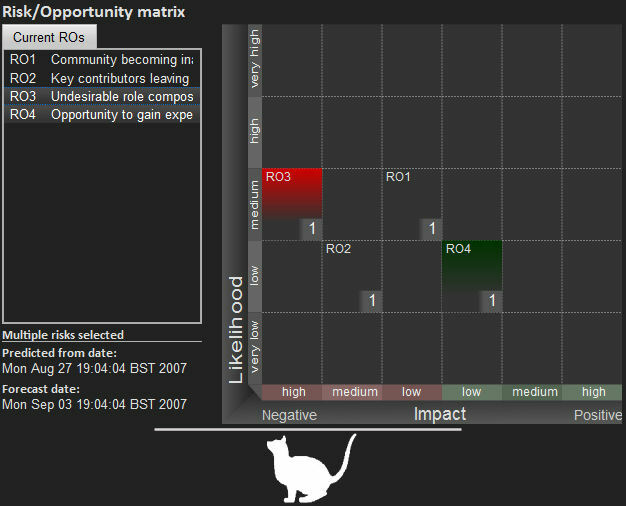 Key to the CAT is that it is not merely an analytics framework for analysing the state of a community at the present; but offering an insight onto the future state of the community. 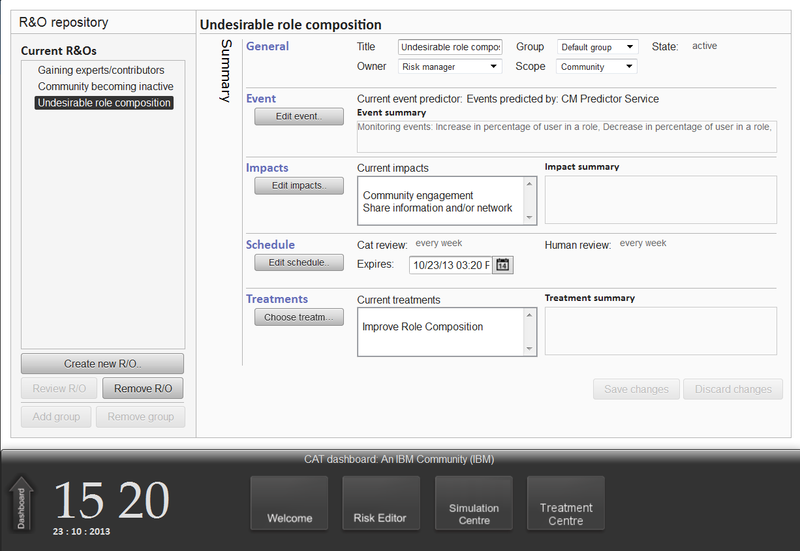 In addition to the CAT framework itself, IT Innovation developed simulation models for allowing users to simulate what-if scenarios for their communities, e.g., for taking a certain action to address a risk. These models were also used as predictors, to give indication of risks such as community becoming inactive in the future. IT Innovation published a paper about the risk management framework, which interested readers are referred to for further information. This paper was given a best paper award. Nasser, Bassem, Engen, Vegard, Crowle, Simon and Walland, Paul (2013) A novel risk-based approach for online community management. In, ICIW 2013, The Eighth International Conference on Internet and Web Applications and Services, 23 - 28 Jun 2013. 6pp, 25-30. Working on real community data from SAP, IBM and public communities, ROBUST evaluated and demonstrated the applicability of community management tools to online communities in internet, extranet and intranet settings addressing customer support, knowledge sharing, and hosting services. The ROBUST project was a 36 month project funded by the EC FP7 framework programme. ROBUST has received EC research funding.